Donations to the Safe Harbor Fund sustain animal transportation programs including in-state and out-of-state rescue transports, gas for shelter van, staff transport for educational purposes, and animal transport to veterinary offices. Please enjoy these animal stories from some of the recent beneficiaries of the Safe Harbor Fund. Your donation to the Safe Harbor Fund makes rescues like these possible. Thank you! 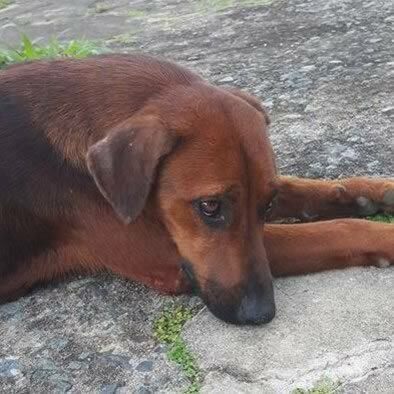 Loui was found in the middle of the street in Canovanas, Puerto Rico. As the photo (left) shows, he was extremely thin and malnourished. Hungry and weak, Loui was barely able to move. 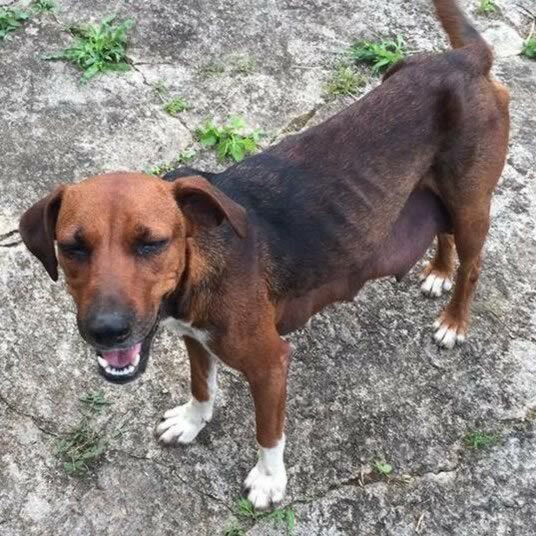 All Sato Rescue in Puerto Rico fostered Loui, bringing him back to health. They were able to care for him because Cape Ann Animal Aid had committed to taking him in -- thanks to funds available in the Safe Harbor Fund. Loui was transported to Cape Ann Animal Aid in July of 2017 and was soon after adopted. 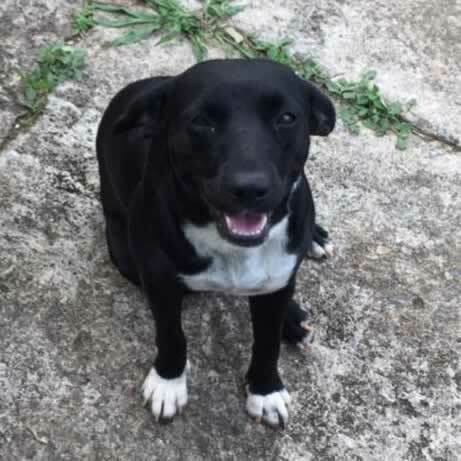 Juniper aka "The Tree Mom"
"The day after we arrived in Puerto Rico, we were catching up with Edi from All Sato Rescue when we were alerted to a dog in nearby Trujillo Alto, PR that needed help. We gathered supplies and headed out with Edi and her rescue partner, Ivan. 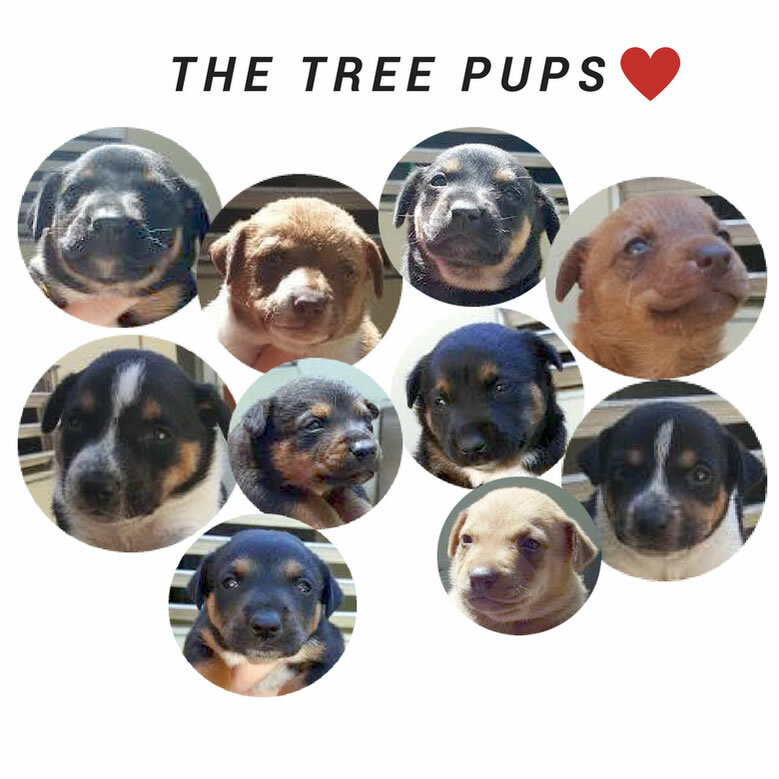 The dog was reportedly living abandoned in a hallowed out tree with a litter of puppies. When we arrived, we were greeted by a very friendly black and white young female whom we later named Leticia. She was so sweet and friendly, she rolled over on her back and showed us her belly. Directly after we met Leticia, we saw the 'tree mom' (later named Juniper). She was skinny and obviously nursing. They were both super sweet females. Then we saw another dog nearby. She was a little more reserved and did not come directly over to us -- even resisting the temptation of cheese sticks and pepperoni at first! We later named this dog Trinity. 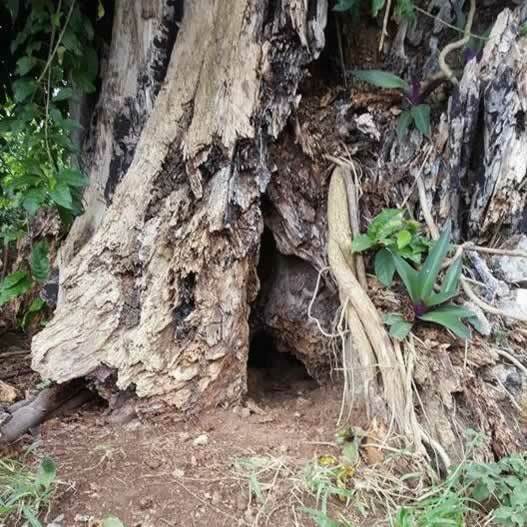 After surveying the area and meeting the three adult dogs, we started to examine the hollowed out tree. We had no idea how many pups were in the tree but Juniper seemed excited that we were there -- as if she knew we were there to help and not to harm. She was so smart to keep her pups in the tree--safe from predators. Juniper tried to help us with the rescue mission. She would go back into the tree and lead the pups toward the entrance where we could reach in and scoop them out. We got eight pups out pretty easily but Juniper eventually got tired of going back in and out of the tree (she had to crawl down and in and up and out each time). We knew that we'd have to do a little creative thinking. After nine pups were out, we could tell that there was at least one more inside. I went around to the back of the tree and broke through the rotting roots to grab the last pup. Once I had my hand on the puppy, I was not sure I could pull it through the small hole but somehow I managed to just squeeze him through. With Juniper and her pups safe in the car, I was ready to load up Leticia and Trinity too. The trouble was that with so many homeless dogs in the area and without a foster home or transport commitment from a shelter up north (like Cape Ann Animal Aid), the rescuers have to put top rescue priority on moms and puppies first. Ivan agreed to foster Leticia...but we would have to leave Trinity behind. The neighbor said he would keep an eye on her for us but it was really hard to leave her behind. We took Juniper, Leticia, and the puppies back to Edi's house where we bathed everyone. The pups looked pretty good -- there were a few ticks and some had missing patches of fur but they were all of healthy weight. Juniper did a great job taking care of her babies! Ivan took Leticia home to foster and we settled everyone in for the night. I got to work talking with my colleagues at Cape Ann Animal Aid. Did we have the funds to transport these pups to Massachusetts? Could we commit to taking in Juniper, her pups AND Leticia and Trinity? Thanks to generous donors like you and reserve funds in the Safe Harbor Fund, we could! We returned to rescue Trinity from the tree the next day. She was so very excited and thankful to see us again! A few months after we got back from Puerto Rico, I was able to see all of these amazing dogs again. This time, they were happy, healthy, and thriving in Massachusetts. All of them have been adopted and we were lucky to see many of them at our most recent Rescue Reunion! I'm so thankful for the Safe Harbor Fund. It keeps Cape Ann Animal Aid's animal transport program going and that means so much to the animals I've met while down in Puerto Rico!" Your gift to the Safe Harbor Fund helps animals like Juniper, Leticia, Trinity, and the pups! In late November of 2015, Cape Ann Animal Aid picked up some animals from an over-crowded rescue group in Massachusetts. One of these animals was Maria, a sweet cat suffering from a deformed back foot. 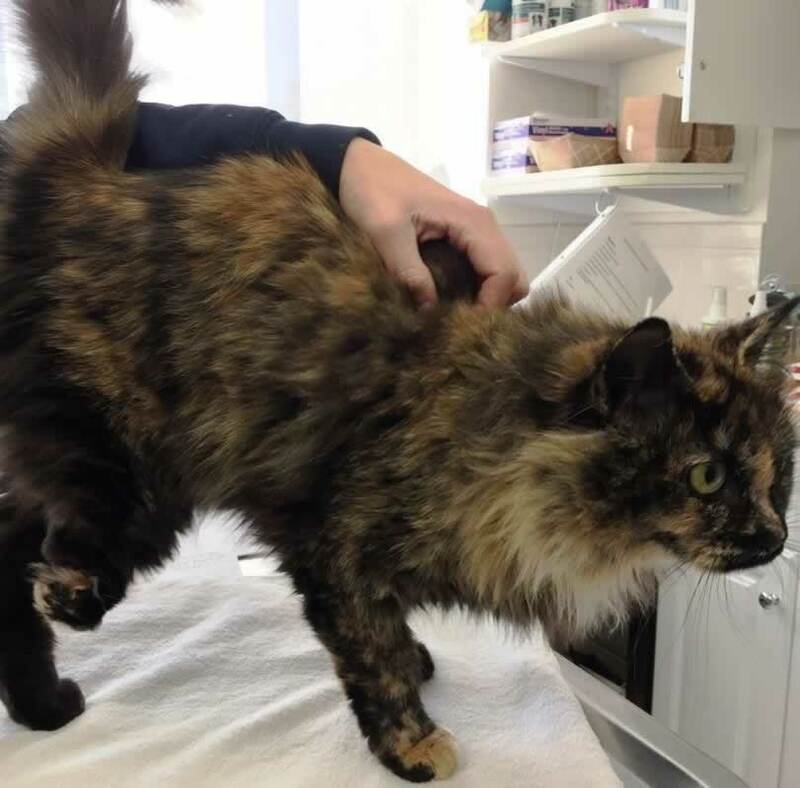 At first, we thought that it was a birth deformity but the vet discovered that it was actually the result of an old break that had healed incorrectly. Thanks to the Safe Harbor Fund, Maria was now in our care and was able to have leg-amputation surgery to relieve her pain. She recovered quickly and was soon adopted! 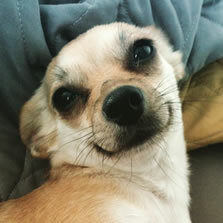 Lanie was found as a stray in Los Angeles and ended up in an over crowded, high-kill shelter. Just days before her scheduled euthanasia, a partner rescue group pulled her and other dogs from the shelter, knowing that Cape Ann Animal Aid had room and the necessary funds available to care for them. Lanie arrived via plane and after a van ride from the airport, settled in quickly. She received medical care and was spayed before being quickly adopted. Her new family reports that she offers boundless amounts of joy to all she meets! During a recent vet visit with her new family, it was discovered that Lanie had been shot with a BB gun at some point in her past. Thankfully, the Safe Harbor Fund led Lanie to safety and her new family sends thanks to all who support these efforts. Why Transport from Out of State? Local animals are always our first priority. We take in cats and dogs not just from the Cape Ann area but also from surrounding towns and across Massachusetts. In addition to local animals, we intake cats and dogs from other parts of the United States and beyond that have extremely high euthanasia rates due to lack of spay and neuter practices and low adoption interest (areas like Georgia, Texas, Alabama, Tennessee, LA, Mississippi, Puerto Rico and Turks and Caicos). We began interstate animal intake because families and potential adopters would often contact us wanting to do the right thing by adopting a homeless dog but were frustrated by the lack of puppies in local shelters (a reflection of the progressive spay and neuter practices in this area). As a result, these families would turn to pet shops and breeders as their only option. Once we began participating in interstate dog transportation, these families were happy to rescue an animal that in their own communities, faced very little chance of finding a home or may have been euthanized. Over the past five years, there has been a marked decrease in the number of homeless kittens in the Cape Ann area. The Safe Harbor program allows us to intake kittens and young cats from over-crowded rescue groups in greater Massachusetts and beyond. Some transports from other regions will also include litters of kittens or young cats that would otherwise face euthanasia. The transportation program has been incredibly successful, saving thousands of animal lives over the past ten years and increasing traffic to our shelter. As a result, our entire cat population, adult dogs, senior, and special needs animals have all benefited. Often those puppy or kitten adopters have a neighbor, friend or relative who they tell about some of the other animals they saw here and that leads to more adoptions for the cats and dogs in our care. How do the animals travel? Animals that are being transferred from Massachusetts shelters are often picked up using our shelter van. Animals from some southern states or Puerto Rico often arrive by passenger or cargo plane and are picked up at the airport and brought back to our shelter using our shelter van. Some out of state transports are done by our staff/volunteers, driving our shelter van. Some rescue groups drive the animals to our shelter in their own specialized transport trucks. All animals that have been transported from out of state must be held for a state-mandated 48-hour isolation period within our certified isolation wing. They receive loving care from our staff and after receiving a health check, are spayed/neutered and moved to our adoption wing, ready to find loving homes! Feel free to contact us if you have any more questions about our animal transportation program.